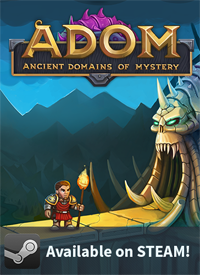 The Official Blog for ADOM (Ancient Domains Of Mystery): Full Steam release: ADOM 2.3.6 is here! Full Steam release: ADOM 2.3.6 is here! We are happy and proud to announce ADOM 2.3.6, yet another major milestone in the recent series of ADOM releases. ADOM 2.3.6 contains a ton of changes (despite the rather small version number increase), especially related to user interface improvements and bug fixes. It is a full Steam release - no beta fiddling or anything required. 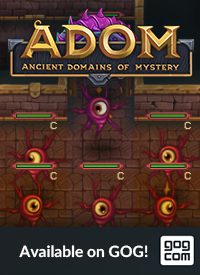 This could be the perfect time to enter the community of folks playing ADOM at Steam as we currently do have a 10% discount due to the Halloween sale - and it's not going to become better than that as we instead intend to continue increasing the value of your purchase by adding more and more content for years to come! Much smarter left-click interactions with the mouse (and customized mouse cursors). More quick hints to point to advanced commands. A streamlined and smarter tutorial to simplify getting into ADOM. Humans and fighters have been buffed somewhat to make them more interesting. Priests, druids and paladins start slightly more pious. Priests now always start with the "Cure Light Wounds" spell. Additionally healing spells have been rebalanced. Races and professions now are sorted alphabetically during character generation. You now start with some quests to lead you into the right direction. Paying has been greatly simplified. Moving into doors now offers a much smarter dialog. The various game modes have been slightly renamed to lead new players better into the game. Various other minor UI/UX improvements (probably 80+ since the last release as we have started doing supervised user interface / user experience tests in our new UI/UX lab). We are going to exchange the videos and images on Steam for much more recent versions. We are going to do a full (non-Deluxe) public release of ADOM. We are going to finish ADOM 2.4.0 (might become 3.0.0) to finish our crowdfunding promises. 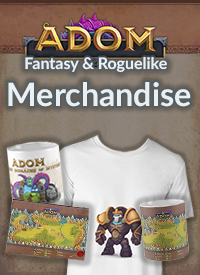 And at the weekend I'm going to do the final wave of ADOM crowdfunding physical rewards shipments. Most people by now should have received their stuff and if you did not yet, please go to the crowdfunding fulfillment portal and confirm your data (not on Indiegogo - that data is long out of date and sync). If you are among the few who haven't done so and then don't confirm your data by the weekend you are out of luck. It's over after that. And then it's going to be the future :-) ! Is there something specific I have to do in Steam to trigger the update? My version still says 2.3.5 in the title bar and the start screen. Cancel the Test Project then it will bring back. How can I turn off the new 'helpful' hints and use the commands I'm used to after playing the game for many years? ADOM 2.3.5 released as Steam beta!